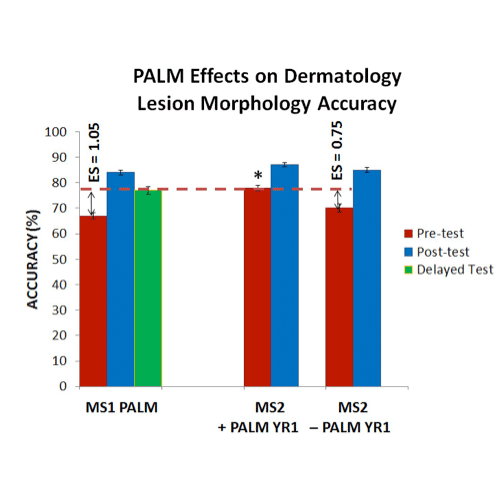 The Dermatology PALM significantly improves identification of lesion morphology (as well as secondary configuration and anatomical distribution; not shown here) and improvement is maintain for at least one year. 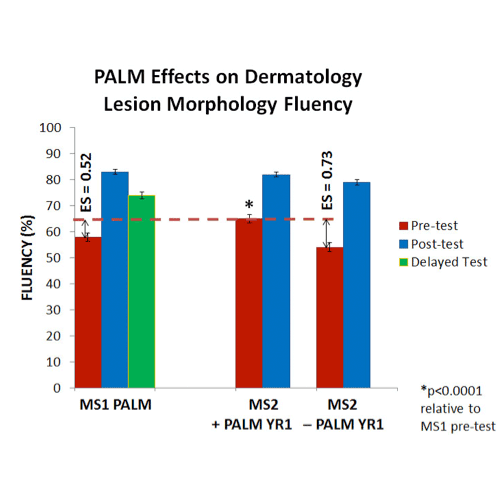 MS1 were given the option to complete a Dermatology PALM that focused skin lesion morphology. Half of the students (79) completed this PALM with resultant large and statistically significant improvements (p < 0.0001). The following year, as MS2’s, students were required to complete the Dermatology Morphology PALM along with the Configuration and Distribution PALMs. Those who had completed the PALM training the previous year did significantly (p < 0.0001) better on the pre-test as MSS2’s both than they had done on the pre-test the previous year and than those who had not done the PALM training previous did. Fluency measures accurate recognition within 6 seconds. ES indicates the Effect Size. 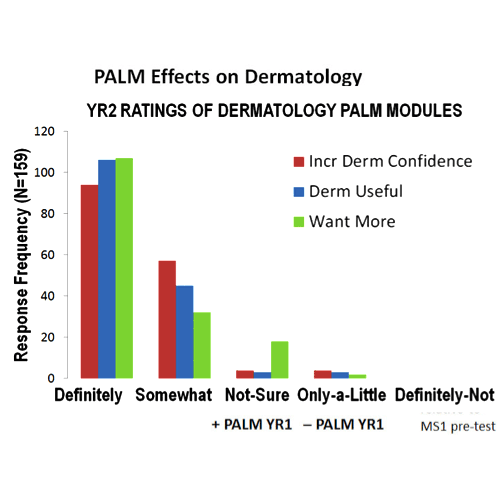 A survey of MS2 students indicated that the Dermatology PALM increased their confidence in identifying skin lesions, that they found the PALM useful, and that they wanted more such PALMs in other parts of the curriculum. For further details, see Rimoin L, Altieri L, Craft N, Krasne S, Kellman PJ. Training pattern recognition of skin lesion morphology, configuration and distribution. Journal of the American Academy of Dermatology. 2015;72:489-495.